The Fourth of July, also known as Independence Day, marks one of the most memorable days in the history of America. Once the legal separation of the Thirteen Colonies from Great Britain occurred on July 2nd 1776, Congress focused on the Declaration of Independence explaining the decision which was put together by a committee of five including Thomas Jefferson as its principal author. After Congress debated and revised the wording, the Declaration was officially approved on July 4th. The Fourth of July is a holiday filled with patriotic celebration remembering the day we gained Independence and formed our new nation – the United States of America. Common traditions include patriotic displays, fireworks, BBQ’s, parades, carnivals, picnics, baseball games, and lots of quality family time. Instead of fueling all those loved ones with the typical cookies, pies, and unhealthy sugary desserts, try out some of these unique and easy healthier options utilizing fruit! You can still add a little frosting, or colored chocolate to add to the festivities, but having the additional nutrients you’ll get from the fruit will add to a healthy and happy celebration. The pictures below are of really simple, unique idea’s to incorporate fruits, especially Apples & Cherries! 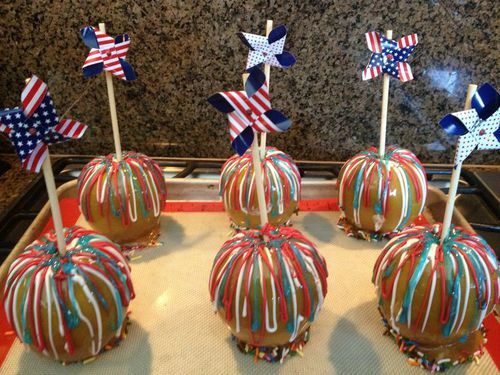 Add your own decorations to your favorite caramel apple recipe! 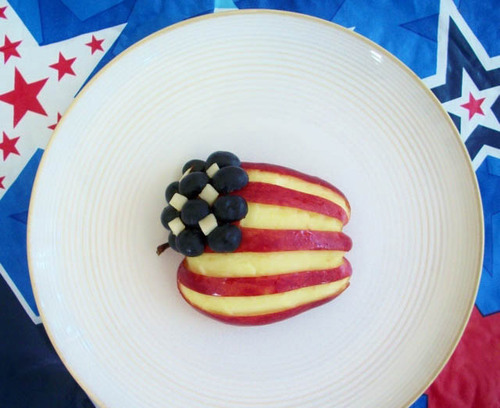 Or crate a neat unique flag carving out the stripes in a Red Apple and adding blueberries with some lite whip cream or frosting so they stick. These apple-watermelon-blueberry pops look really fun to make with the family! Get yourself a couple star cookie cutters (or really any shape you’d like), slice your apples and watermelons to whatever width you’d like and get to cutting! 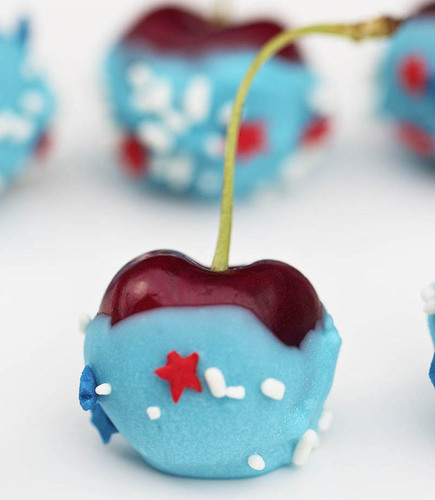 You can use some dark sweet cherries to add some color to really anything! 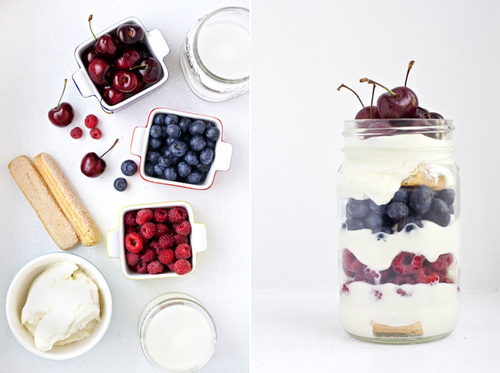 See this really easy trifle using blueberries, cherries and raspberries. You can add your favorite trifle cream or even use cool whip. 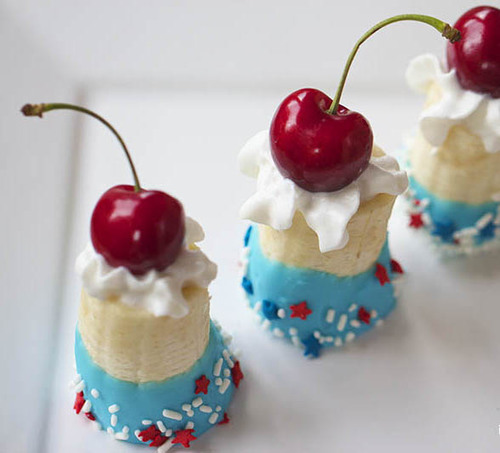 Another neat easy idea is to do one of these chocolate dipped Banana’s topped with a cherry, or just dunk the cherry itself. Perfect little snacks for everybody in the family to enjoy while getting those recommended daily fruit servings in. 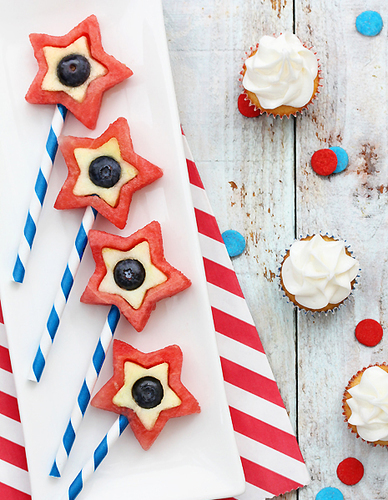 Borton Fruit wishes everybody a safe, happy & healthy Fourth of July. We will be shipping from 7:00AM-Noon on Friday the 4th and 7:00AM-Noon on Saturday the 5th.